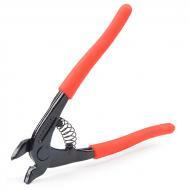 Precise, high-quality glass and tile nipper for mosaic artists. Carbide-tipped blades nip tiles in halves, quarters, diagonals and other shapes. Lightweight and coated with a plastic handle for securely gripping while you work. Can also be used to cut rods and cane.